Cvent provides software that helps people manage events and meetings, and has over 4,000 employees and 25,000 customers worldwide. They were in the market for a comprehensive communication system for events, as well as internal communication. After trying a variety of different video conferencing tools, the company decided on Zoom. Zoom provided a consolidated platform that was simple to start and join for any employee, and helped Cvent save money on conference room hardware. 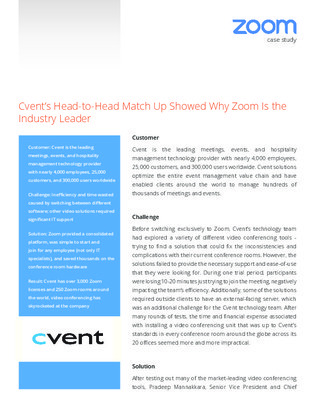 Download this case to learn more about Cvent’s experience implementing Zoom.